The urine sample should be collected in a clean glass or plastic container. Open the foil pouch at the notch and remove the test panel. Place on a clean, flat surface. Using the enclosed dropper, place four (4) complete drops of urine in the Sample Well (S). Note: Hold the dropper vertically to avoid air bubbles. 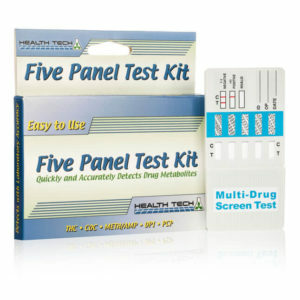 If excess or insufficient urine is used, test may not perform properly. Do not disturb the device while test is in progress. Wait five (5) minutes to read the results-do not interpret results after ten minutes. One pink/rose lines appears in the Control Zone (C) with no apparent line in the Test Zone (T). The sample DOES contain drug metabolites. Two pink/rose lines appear (no matter how faint)-one in the Control Zone (C) and one in the Test Zone (T). The sample does NOT contain drug metabolites. No pink/rose lines appear after 10 minutes, or a line appears in the Test Zone (T) but not in the Control Zone (C). An invalid test result may be due to improper testing procedures or because of a defect. Click here to read more about Urine Testing.